Richard Milhous Nixon (Januar 9, 1913 — April 22, 1994) wis the 37nt Preses o the Unitit States frae 1969 tae 1974. He succeedit Lyndon B. Johnson on 20 Januar 1969 an wis re-electit in 1972, ower George McGovern. He is the only US Preses tae resign, efter the Watergate scandal, an wis succeedit on 9 August 1974 bi Gerald Ford. He wis also Vice Preses o the Unitit States, frae 1953 tae 1961 unner Dwight D. Eisenhower. 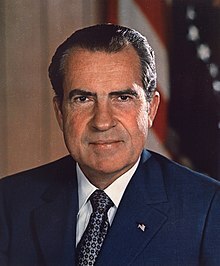 Wikimedia Commons haes media relatit tae Richard Nixon. This page wis last eeditit on 1 Mairch 2018, at 00:45.